Forget Guitar Hero and Rock Band - it's time for Scrabble and Monopoly. Will the 'new' GM succeed? 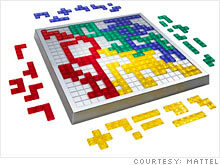 NEW YORK (Fortune) -- Mattel is betting on Blokus. For the uninitiated, that's a quick strategy game that bears just about no resemblance to the mainstream big sellers such as Uno for which Mattel (MAT, Fortune 500) is known. But when the company acquired Blokus earlier this year, it was to capitalize on the growing cachet hobby games have with twentysomethings -- a demographic that Mattel's aggressively pursuing, says Geoff Walker, Mattel's senior vice president of Wheels, Games and Radica. It may seem like an odd move, but not only have hobby games like Blokus taken hold with the next generation, board games on the whole have seen a bounce in the past year. In 2008, board game sales climbed 23.5% to about $808 million, and they're expected to grow more this year. Of course, board games have lived in the shadow of video games for the past decade. Through 2007, video game sales had been growing steadily by more than 7% a year -- sales that year totaled $12.4 billion -- while board games had been experiencing a steady slide since their heyday in the '80s. But with the onset of the recession, as video games have suffered from the dip in consumer spending, their older, less-costly cousins -- Clue, Candy Land, and the like -- have benefited. The economic downturn has created what many experts call a "recession-resistant" industry -- one that, for families operating on tight budgets who have children to entertain, is attractive no matter the economic climate. And in the case of board games, they might even be most attractive in the worst times. That's especially true now, according to industry specialist Chris Byrne, also known as the "Toy Guy": "Considering what it would cost for four people to go to the movies, board games are a deal!" Historically, board games have always fared well in recessions, Byrne says. Parcheesi was all the rage during World War I, and in the Great Depression, Monopoly was the hot-ticket item. But while current sales fit the trend, today's bestsellers may be more unexpected. By appealing to young, adrenalin-driven consumers, hobby games like Blokus have scrambled ahead of Scrabble and other traditional games. Last year's top game was Settlers of Catan, in which players race to build cities, and this year's new craze is Wits and Wagers, a fast-paced trivia and gambling game. Unlike classic board games, these hobby games focus on quick game-play -- generally, a full game can be played in less than an hour -- and are designed to be different every time. They also incorporate more strategy, challenging players to earn points in multiple ways by, for instance, solving a puzzle or stealing pieces from their opponents. But don't expect to find these offbeat winners at the local Wal-Mart. Most of these hobby games are so expensive to produce that they are only sold in niche toy stores or online, says Mark Kaufmann, the vice president of sales and marketing for game publisher Days of Wonder, "so it's word of mouth" that drives their success. And some board game publishers say it's actually the movie theater that worries them the most. "My biggest competitor is Time Warner, not video games," says Jay Tummelson, president of Rio Grande Games, which publishes the popular strategy game Carcassonne. "If you spend all your time watching movies, you'll never get around to playing games -- that's what I'm concerned about." Wherever the challenge comes from, board game makers are bracing for it by touting what they see as board games' key differentiating characteristics -- their educational and family value. But that doesn't mean they've shied away from technology altogether: Games like Scene It? -- where clues are on a DVD, but players move their pieces on the board -- converge the video and board game worlds by bringing some game-play onto a digital platform. 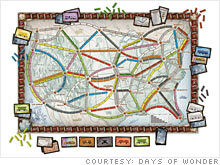 As important as innovation may be, human interaction remains board games' biggest draw. Even in the video game arena, games like Halo rely on headset communication between players. And multiplayer, low-tech systems like the Wii have found huge followings by encouraging team play, says Stevanne Auerbach, a child development, education, and psychology specialist. But board game publishers say there's nothing like the banter that brews when you're sitting around the kitchen table with an old-fashioned Monopoly set -- banter that probably couldn't happen during a game of Grand Theft Auto IV. "I don't think board games are going away," Byrne says. "In a screen-driven world, we really need human interaction -- that's something that board games have that hasn't been replicated."